This luxury boutique hotel - is a stylish base to discover the city. Hotel Damier is the place where history has been combined with contemporary charm, it is a hospitable hotel where service comes first. We welcome you in our 65 stylish rooms and suites. All our rooms combine comfort and elegance with contemporary technology. Every room features an Ipad. All the room types are mentioned in our booking engine. At the hotel you can enjoy of our brasserie, restaurant and cocktail bar. We only use the best products and serve these in a convivial atmosphere. Hotel Damier is located within walking distance of ‘K in Kortrijk’, a prestigious shopping mall that puts Kortrijk on the map as a cozy shopping city. Do you prefer to go on a cultural tour? Hotel Damier is a stone's throw away from museum '1302' and the 'Texture museum'! An exhibition in Kortrijk Xpo? 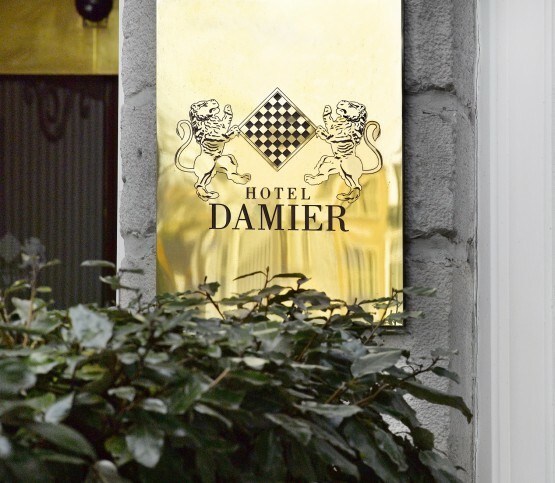 Hotel Damier is the ideal location, close to Kortrijk Xpo and still centrally located! 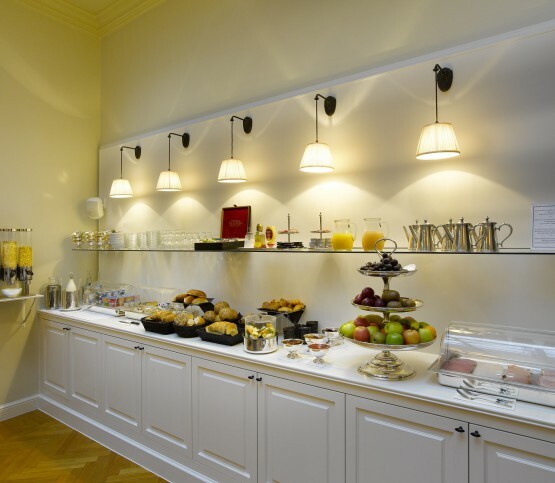 Our Royal buffet breakfast is served in our orangery and contains a large variety of bread, bread rolls and viennoisery, home-made jams, fresh fruit salad and fruit, juices, large variety of cheese and cold cuts. Our healthy corner contains seeds, nuts, superfoods, muesli, granola, fresh yogurt and quark. Also for our gluten free guests we have a special selection. The egg menu, is being prepared the moment itself at your request and is included in the rate. We also serve different coffee and tea specialties. 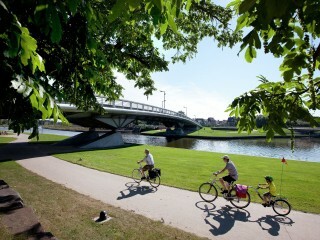 Would you like to discover Kortrijk by bicycle? We have 4 bikes available for free at the hotel. Please contact info@hoteldamier.be to reserve your bike. 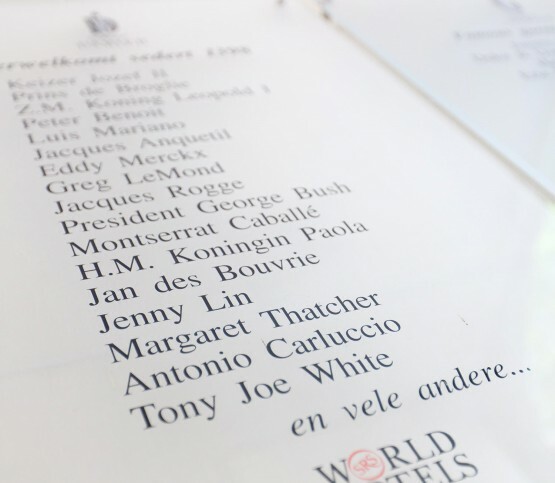 Not just the hotel is legendary, the same can be said of its guests: Emporer Joseph II, King Leopold I, Queen Paola, President George Bush Sr., Margaret Thatcher, Eddy Merckx, Montserrat Caballé, Adamo, Sheryl Crow and Lance Armstrong preceded you as guests in our hotel. More recently we can also added the following guests: Praga Khan, Prince Lorenz and Princess Astrid, Christine Lagarde, Maggie De Block, Roger De Vlaeminck, Tom Boonen etc. We are looking forward to welcome you soon in Hotel Damier Kortrijk. Hotel Damier is affiliated with the international organization Worldhotels. 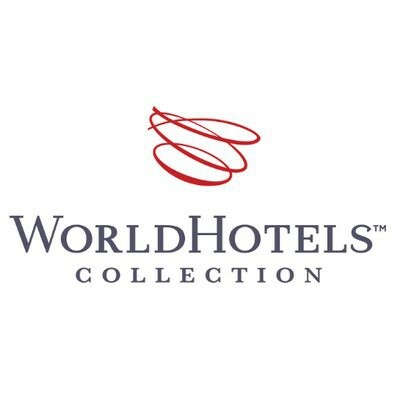 Worldhotels consists of an exclusive collection of independent hotels worldwide. By reaching more than 45 countries and six continents, the group focuses on business travelers and holidaymakers who are looking for an authentic and local experience when choosing a hotel. It offers hotels with character, and that makes the difference! Driving 'in style'? Hotel Damier is offerting a taxi service with a driver! Just ask and we take care of this! Our Mercedes Maybach is ready for you. Prices on request.